So, you like to play golf. Ever wish there were a way to see how you can improve your swing? Thanks to a new Bluetooth accessory called SwingTip, now you can. It's pretty simple: install the companion app, put SwingTip on your club, pair it with your phone, and swing away. The unit automatically detects your swing and and sends the info back to your phone or tablet. From there, it can give you all the info you've ever wanted to know about your game, including a full animation, club head speed, swing path, club face angle, impact zone, and tempo. Of course, adding anything to your club is going to alter the weight, right? SwingTip weighs in at a mere 1oz, so it's barely noticeable. In fact, SwingTip claims that "even the top PGA pros can't tell a different in their swing." SwingTip is available now for $130 and can be found right here. “SwingTIP goes beyond ‘activity tracking’ and ‘metrics’ to turn your mobile device into a personal swing coach that assesses your swing in real-time,” said Vijay Nadkarni, Founder and CEO, Mobiplex. “It creates the ultimate interactive learning experience by telling a golfer what happened, why it happened, and how to improve." To design SwingTIP, Mobiplex engineers partnered with leading experts in golf, including Masters Tournament Champion and PGA Pro Craig “the Walrus” Stadler; Ray Leach, former PGA player, NCAA record-holder and instructor at Peacock Gap Golf Club; and David Butler, a 2011 Golf Digest Best Club Fitter and expert in professional-grade golf swing analysis technology. As Jack Nicklaus famously said, “I never hit a shot, even in practice, without having a sharp, in-focus picture of it in my head.” SwingTIP features a patent-pending ProView Motion Analysis™ engine that can accurately capture, analyze, and digitally reproduce a video-like animation of a golf swing in three dimensions. Visually analyze the parts and positions of your swing to “see your swing characteristics” and understand “why the ball faded left.” Review your swing alongside key performance metrics that pinpoint what happened including Swing Path, Club Face Angle, Impact Zone, Club Head Speed and Swing Tempo. To help golfers adjust, correct, and improve fundamentals, the SwingTIP mobile app let’s users save and review favorites, and provides instructional tips, videos and reference swings from Ray Leach. Practice session scorecards summarize performance stats and can be emailed from within the app to a friend or Pro for advice. 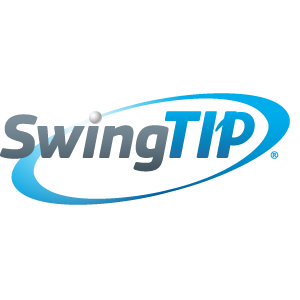 Wirelessly upload swing data to MySwingTIP.com to see “Performance Summary and Trend” reports for any time period, and club-type. “SwingTIP helps golfers achieve greater impact at the moment of truth – when the club face hits the ball. 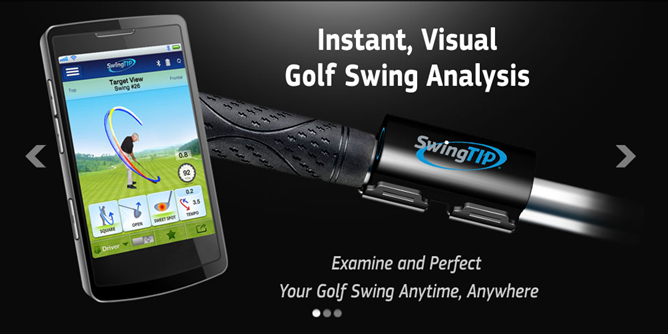 The instant visual and statistical analysis that SwingTIP delivers makes it the most efficient, effective and fun way to master the sport," said Ray Leach. Weighing just one ounce and with dimensions similar to a USB flash drive, the SwingTIP device won’t affect your swing. The two-part device consists of a Bluetooth-enabled 3D motion sensor that slides into a club holster. The two-clamp holster keeps SwingTIP securely in place on the club shaft, swing-after-swing. A built-in, pop-up sight lever makes it easy to properly align SwingTIP onto the club shaft. SwingTIP is also energy-efficient, turning itself off when not in use, and staying charged through a 200-swing practice session or a round of golf. · SwingTIP Golf Swing Analyzer Package ($129.99 MSRP) – Wireless 3D motion sensor, club holster clip (with sight-lever alignment tool), shims (for smaller club shafts), micro-USB cable for charging, and Quick Start Guide (free mobile app with electronic scorecards, and a personal MySwingTIP webpage). · SwingTIP 2-Pack Holster Package ($19.99 MSRP) – Attach a holster clip to every club; easily move the sensor from club-to-club for uninterrupted practice. Technical specifications are available at www.swingtip.com/specifications. Press kit materials, images, and videos can be downloaded at www.swingtip.com/clubhouse. Connect with us on Facebook, Twitter,Google+, Pinterest, and YouTube.